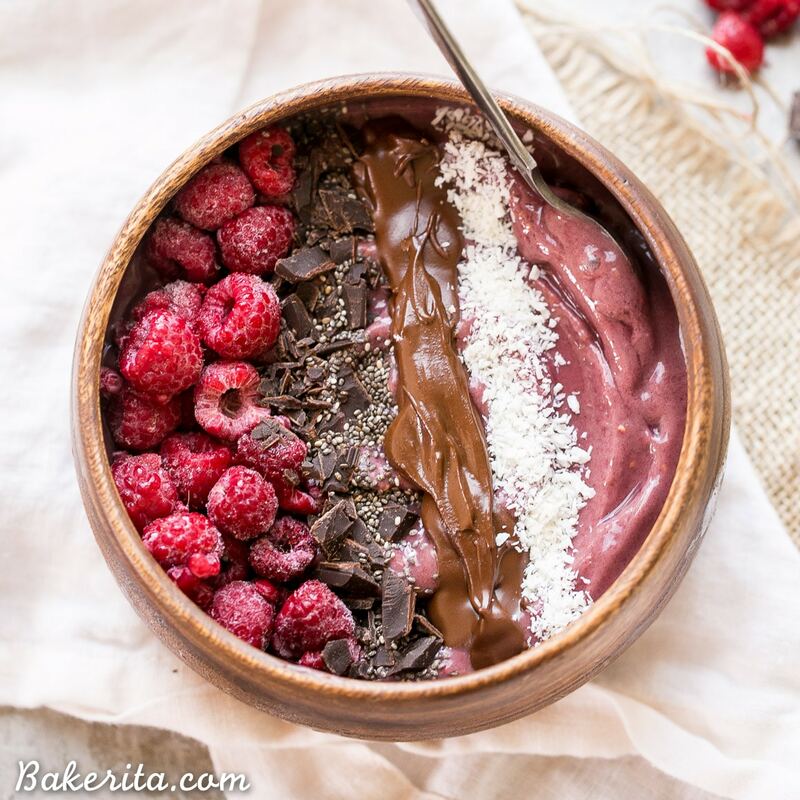 This recipe for a Classic Acai Bowl has only three ingredients, so it’s super simple to make and absolutely delicious! You’re missing out if you haven’t jumped on this easy breakfast trend. You can customize your acai bowl by topping it with your favorite toppings. 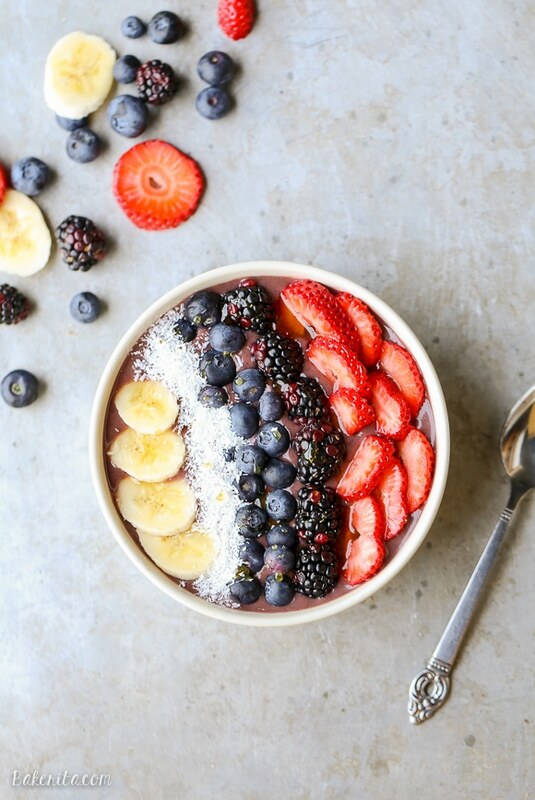 Are you on the acai bowl bandwagon? 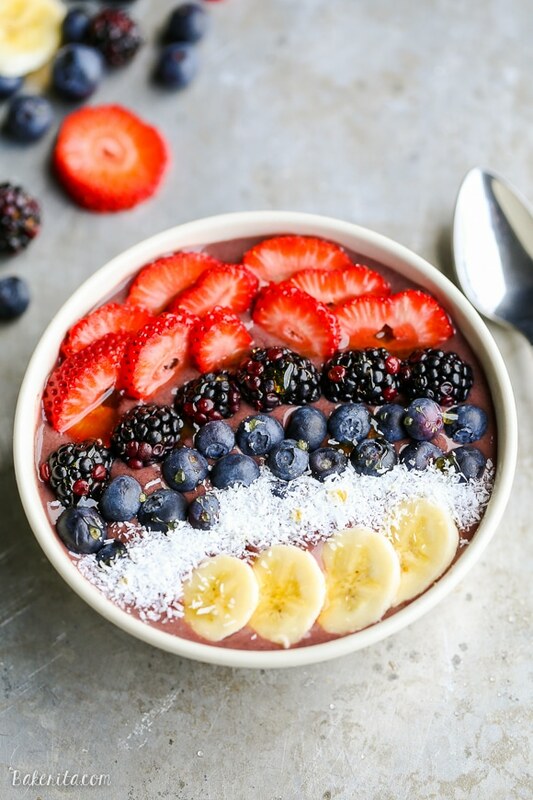 I’ve been acai bowl obsessed for a loooong time now – they’ve been a favorite of mine since I first discovered the Sambazon acai bowl cafe in Cardiff way back in high school. Now, you can find them all over in San Diego, but there were still no places near me to get them in Washington, so they became a treat I only got when I was visiting home. When I went to Kauai last month, my sister had already scouted out a favorite acai bowl place by the time I had gotten there. I must say, she chose well – they were soooo delicious! Acai bowls are a big deal in Hawaii and you can find roadside stands offering an assortment of smoothies, fresh produce, and acai bowls pretty much everywhere. My delicious Hawaii acai bowl sparked a craving, and when I got back to Seattle, I wished as I always do that there were acai places up here. I looked it up and lo and behold, one had opened on my street a few months back. Needless to say, Fit Bar has fulfilling all of my acai needs these past month…but they’ve also been getting a lot of my $$$! So, I decided it was time to take matters into my own hands and make my acai bowls at home. Bonus of making them at home? That means that they’re fully customizable, with all the fruits, superfood additions, and toppings that I want. I can’t believe I waited so long to develop an acai bowl recipe – especially considering how easy they are! It took maybe three minutes and only used three ingredients. You’ll have to scout out some frozen unsweetened acai blend packets. Mine were in 100g packets, which is the perfect amount to make one bowl. I’ve been able to find them at pretty much all grocery stores these days. I like the brand Sambazon, and Trader Joe’s also has their own unsweetened acai. Make sure to get unsweetened! I found the sweetened acai packets to be far too sweet for my tastes, and the added sugar is so not necessary. A frozen banana adds natural sweetness and makes the mixture super creamy. Finally, your milk or yogurt of choice makes the mixture super creamy. I used the vanilla flavor of Silk Dairy Free in this bowl and you could definitely taste the vanilla, which I really enjoyed. I also love using non-dairy milk to help it blend up, and coconut water and juices also work. To make it, simple add the three ingredients to a blender and blend away until you have a thick and creamy acai blend! Pour it into a bowl, top with any and all the toppings you want, and go to town. 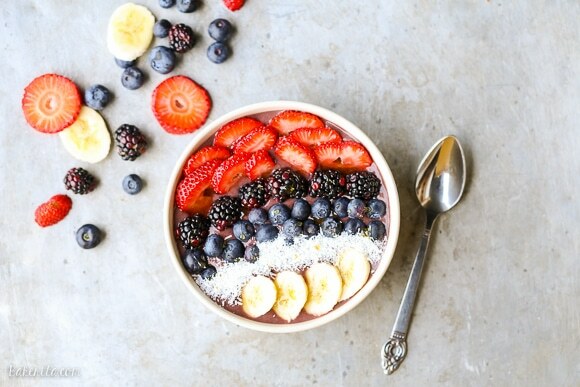 I love topping my acai bowl with berries, granola, and flaked coconut, and a thick drizzle of peanut butter or almond butter is usually a welcome addition as well :) this acai bowl recipe is a breakfast treat is guilt-free but will definitely leave you feeling refreshed and satisfied. Enjoy! 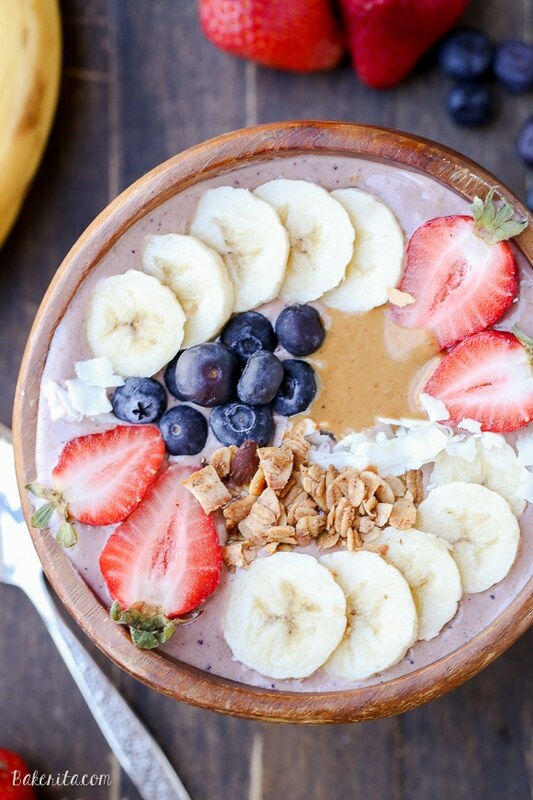 In a high-powered blender, combine the acai berry packet, frozen banana, and 1/4 cup Silk Dairy Free. Blend until completely smooth. Pour into a bowl and top with berries, coconut, and/or granola. 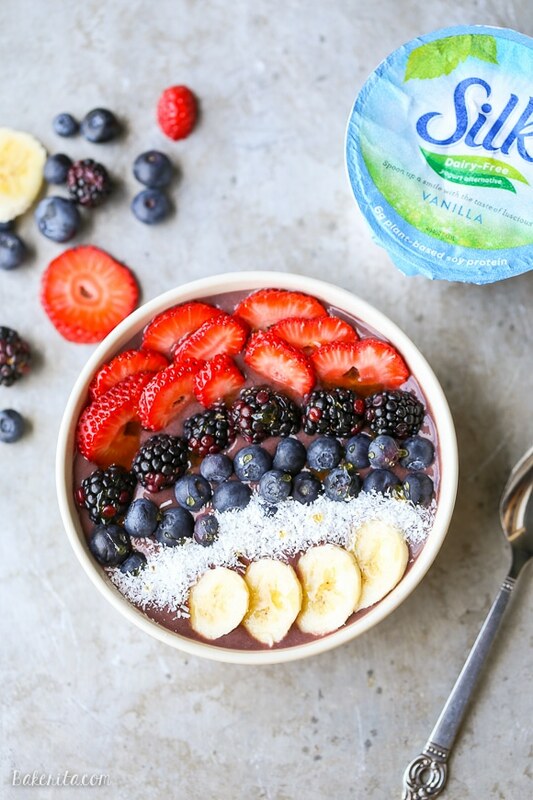 Silk Dairy Free can be substituted with Greek yogurt or dairy-free milk. This is a sponsored conversation written by me on behalf of Silk. Click here for a coupon. The opinions and text are all mine. Thanks for supporting the brands that support Bakerita! 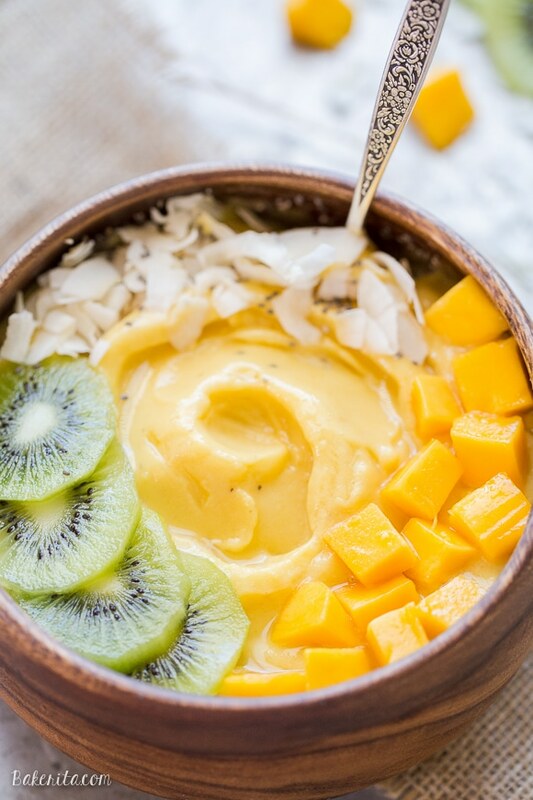 Want more acai bowls and smoothie bowls?! That sounds delicious, Ashley! Glad you’re loving it. Go to Greenlake (or Kirkland) for the authentic Brazilian Acai experience. The place is called Kitanda and its a Brazilian coffee shop with delicious pao de queijo sandwiches and authentic Acai bowls with guarana. I’ve not been to fit bar, but my go to for years has always been Kitanda.